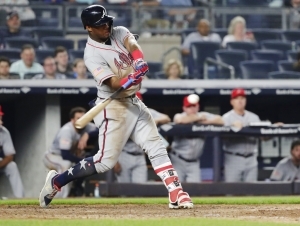 Acuña Jr. batted .545/.630/1.091 over six games last week, going 12-for-22 with one double, one triple, three home runs and nine RBI while guiding Atlanta to a 4-2 record. He had five straight multi-hit games from April 8-13, the longest such run of his career and the longest for any Braves player since 2014. Acuña Jr. also drove in at least one run in each of the six games, the longest RBI streak of his career. Five of his RBI gave Atlanta the lead, while three served as the game winner.